When people think of the United States military’s involvement around the world, they do not often think of its work in Latin America and the Caribbean. But Navy Admiral Kurt W. Tidd, the current commander of United States Southern Command, or SOUTHCOM, explained Monday night that the region has many pressing challenges. 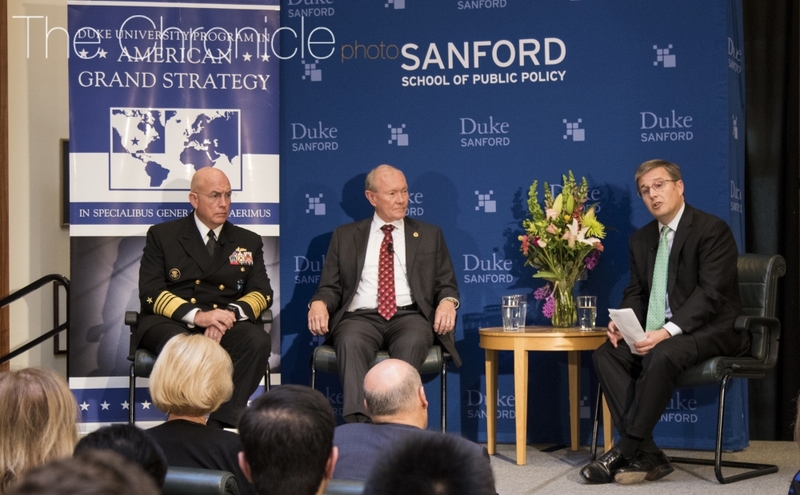 In a conversation with Martin Dempsey—a retired army general who served as the 18th Chairman of the Joint Chiefs of Staff and is a 2016 Rubenstein Fellow—and Peter Feaver, professor of political science, Tidd shed light on his role at SOUTHCOM. Feaver moderated the discussion—which was attended by approximately 70 people—at the Sanford School of Public Policy’s Fleishman Commons. Tidd emphasized that his role with SOUTHCOM requires working closely with his counterparts in the region. SOUTHCOM is responsible for the United States military’s involvement in all of Central and South America and the Caribbean, except Mexico and the Bahamas. Working with those countries can be important in order to build U.S. credibility in the region—especially as countries such as Russia, China and Iran compete for global influence. Tidd argued that the common cultural heritage the U.S. shares with the region, along with strong educational exchange programs for military leaders, have fostered American partnerships. “We look at the world from a remarkably common perspective, with common interests and a common cultural heritage that allows us to work together closely,” he said. Dempsey added that because U.S. military resources are limited, the U.S. government seeks to provide leadership in the efforts of partner nations when a task is broader than the military’s reach. Dempsey noted that the military was not involved in planning the Obama administration’s negotiations with the Cuban government. Venezuela has also had a thorny relationship with the U.S. and recently entered into a deep economic depression. The country’s government has blamed its political instability and economic woes on the U.S.
Tidd said that he has to differentiate the Venezuelan people from their government. Whenever a U.S. military official talks about Venezuela, headlines in the country proclaim that the U.S. intends to invade, he added. “I am here to tell you, I am not planning the invasion or the overthrow of Venezuela period, dot, the end,” he said. Tidd added that helping Venezuela will require the assistance of the international community, but SOUTHCOM is monitoring the situation closely. Feaver asked Tidd about his oversight of the U.S. Naval Base in Guantanamo Bay, the site of the controversial U.S. detention center. Tidd explained that the outpost plays an important strategic role in providing humanitarian relief in the region. As for the detention center, Tidd said SOUTHCOM is responsible for following U.S. policy and conducting operations that are safe, legal, transparent and humane. He emphasized that the people stationed there have a difficult job. Dempsey noted that during his time as chairman, he helped make the determinations about whether detainees could be transferred to other locations around the world. Eventually, they settled on retaining approximately 40 to 50 detainees that the military felt were too high risk to release or that other nations did not want. As a matter of policy, Dempsey said the military needs somewhere to put people detained in combat situations. “Our position with our elected officials was, ‘Okay, Guantanamo is not the place, tell me where is the place,’” he said. President Donald Trump’s proposed budget includes large increases in defense spending, counterbalanced by cuts to the Department of State, the Coast Guard and other agencies. Dempsey said he did not believe such cuts were appropriate, as those agencies have been useful in U.S. humanitarian efforts around the world. “I believe that our government should not only have the resources to have a strong military, but a significant and robust diplomatic effort, as well as organizations like [Center for Disease Control and Prevention] and Health and Human Services,” he said. Deterrence and Dissuasion in Cyberspace: Russia, China, & the U.S.